Artist Rebecca Morledge in her home studio in Ilkeston with one of her finished paintings of Matlock Bath. Historic buildings and characterful market towns are what inspire this Derbyshire artist to capture the county’s ‘places and people’ through her eye-catching paintings. Working from her home studio, Rebecca Morledge uses watercolour paint and ink pens to interpret landscapes from all over the county. Artist Rebecca Morledge in her home studio in Ilkeston. While the 47-year-old has always been passionate about art, it was a breast cancer diagnosis that finally prompted her to chase her dreams of becoming a painter and illustrator. “I’m ok now and have all the all-clear, but at the time it was very eye-opening,” said Rebecca, who works part-time at a library and has just completed a Masters degree in Illustration at Nottingham Trent University. “The dream is to become an illustrator for children’s books, but it’s very competitive and difficult to get into. “I’m heavily influenced illustrators like Shirley Hughes and Quentin Blake, and I think that style comes across quite clearly in my townscape paintings as well. They’re usually painted from a birds-eye view, for example, and always feature cars and people bustling around. Rebecca's recent painting of Chesterfield. “There is just so much character to be found in little town across Derbyshire. “I completed the Chesterfield piece recently after walking round the town and thinking about pretty it was. 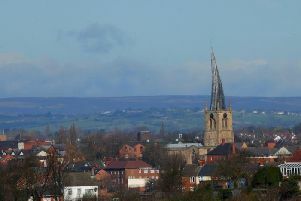 “There are plans to get the painting made into postcards and little prints to be sold at Chesterfield Museum and the Visitor’s Centre, which is exciting. To view more of or purchase Rebecca’s work, visit her website at http://www.rebeccamorledge.co.uk. She also has a Twitter account you can follow @RebeccaMorledge.